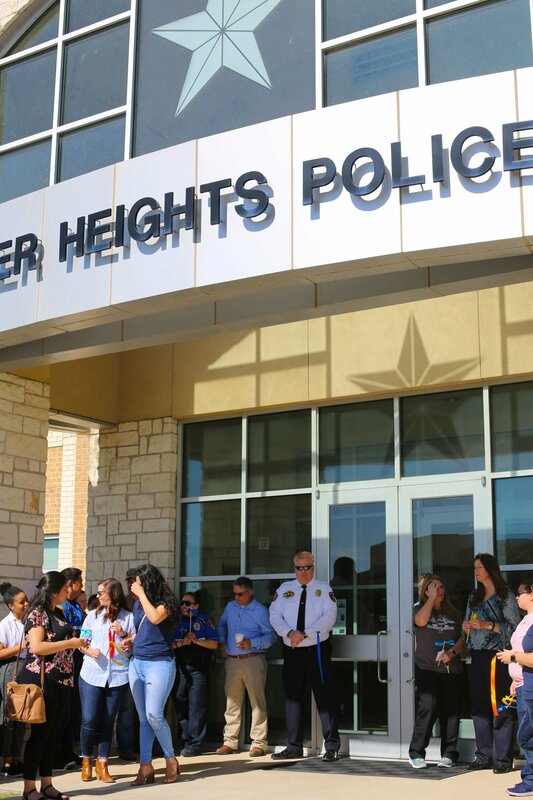 Around 50 people like Stephens gathered at the Harker Heights Police Department headquarters Wednesday morning for Ribbons to Remember, a ceremony in honor of Crime Victims’ Rights Week. In attendance were victims, victim’s advocates, law enforcement officials, district and county attorney’s office personnel, and representatives from nonprofit groups. Many placed a ribbon around the peace officer’s memorial statue at headquarters to remember someone special they have helped; some wrote a message to the victim on their mind. The ribbons will remain for the rest of the week. It was the first year for the Ribbons to Remember ceremony, said Misty Biddick, executive director of Aware Central Texas. She said last year folks gathered at the Bell County Justice Center to plant flowers as part of Crime Victims’ Rights Week. “We’ve come this far but there’s still a lot of work to do,” Biddick told the Herald. Through the years she has seen it all, from working in a prosecutor’s office to helping adults on probation, but what has been rewarding is seeing victims turn their lives around. “Being able to take trauma and turn it into something good is because of the support that enabled them to be successful,” she said. In addition to possibly suffering physical and emotional trauma, crime victims also often need help monetarily. “If the door gets kicked in and the windows are shattered, they need to find money for a new door and a new lock,” Biddick said. Harker Heights Police Chief Phil Gadd reflected on the lasting impact of crime on the victim, their families and friends, but said help is available. Also speaking to the gathering were Bell County District Attorney Henry Garza and Bell County Attorney James E. Nichols. Nichols said his office handles 800 to 1,000 assault cases every year. “When you meet someone on the job, you know they might be dealing with the most horrible thing that could happen to them,” he said. Garza also was passionate about making sure the room full of helpers knew they were appreciated. Hosting the Ribbons to Remember ceremony were Aware Central Texas, the Bell County Crime Victims Coalition, the Central Texas Family Violence Task Force and the Harker Heights Police Department.